In 2015, the New Democratic Party won an unprecedented victory in Alberta. Unseating the Progressive Conservatives-who had won every provincial election since 1971-they formed an NDP government for the first time in the history of the province. Orange Chinook is the first scholarly analysis of this election. It examines the legacy of the Progressive Conservative dynasty, the PC and NDP campaigns, polling, and online politics, providing context and setting the stage. It highlights the importance of Alberta’s energy sector and how it relates to provincial politics with focus on the oil sands, the carbon tax, and pipelines. Examining the NDP in power, Orange Chinook draws on Indigenous, urban, and rural perspectives to explore the transition process and government finances and politics. It explores the governing style of premier Rachel Notley, paying special attention to her response to the 2016 For McMurray wildfire and to the role of women in politics. 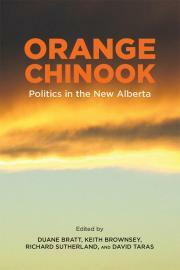 Orange Chinook brings together Alberta’s top political watchers in this fascinating, multifaceted analysis.